Random Song Jukebox #piday #raspberrypi @Raspberry_Pi « Adafruit Industries – Makers, hackers, artists, designers and engineers! After messing around with a Google AIY Voice Kit for Raspberry Pi, I decided to re-purpose the hardware to make an offline jukebox. When a user hits the top button, a random song stored on the Pi will play. The volume knob is there to help adjust the volume and mute the song (since once a song is started, it can’t be stopped). 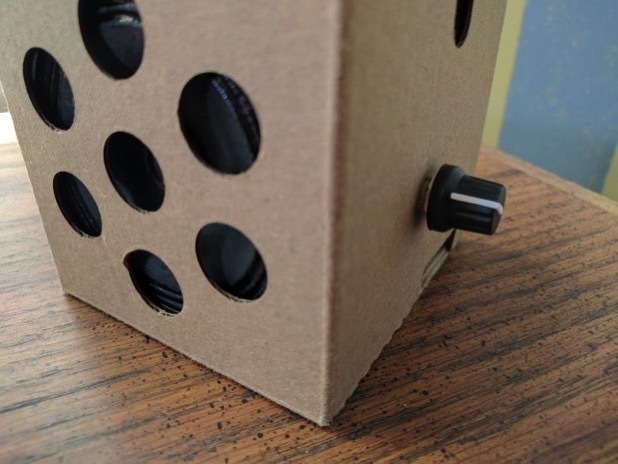 This tutorial picks up assuming you have already bought and assembled the Google AIY Voice Kit, or similar hardware configuration (a Raspberry Pi with a speaker and button attached). You’ll also need a rotary encoder for the volume knob (I used this one), as well as wires, solder and a soldering iron to attach the encoder to the device.